For the first time in 10 years, I am not hosting a 4th of July party. When I moved to my first house, it was to a neighborhood close (walking distance) to the fireworks in my city. The next house, has a neighbor with a really great view, so at the end of the BBQ, my friends, all the kids and I would walk to the hill behind my neighbors house. It was lovey, it was wonderful, it was a lot of work. This year, the kids are gone to grandma’s house and the husband is travelling. That is too much work and food to bring chaos to a house I get to clean up alone. So, this is the year the annual 4th of July party went bust. Mix the above ingredients and form into 8 hamburgers. Grill to desired doneness. This salad contains no mayo- so it is relatively safe to have out and about during a warm picnic. Boil the noodles, and on a warm day, boil the noodles early, early in the morning, with windows and doors open to get the heat/steam outside before it gets too hot. Drain the noodles and set aside (Do Not Rinse the noodles, it keeps the dressing from sticking to them). Mix the Balsamic, Olive Oil, Seasoning and toss in the noodles till completely covered. Let noodles cool in the fridge. Bring out and toss the Tomatoes, Salami and Mozzarella. (You want the noodles cold for this so they don’t melt the cheese or get the meat too greasy) If the noodles have soaked up all the dressing, make some more and toss again. Serve room temperature. As always, when BBQing outside, please be aware of food safety guidelines. We want poeple to remember the party, not the after effects! One way to change things up in a salad is to change up the ingredients. Recently, Ive been all about red peppers, cucumbers, and tuna or chicken. But another way to change up the taste of the salad is to change the salad dressing. Historically, I love blue cheese dressing, another no-no in the new eating plan. So I rotate usually between italian or a drizzle of balsamic with olive oil. The cafeteria in my building has recently started offering a Roasted Tomato Vinaigrette. I am in LOVE! 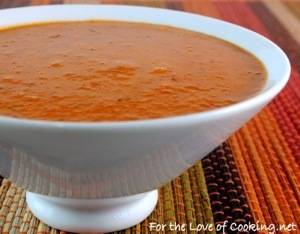 The tomatoes lend a creamy and hearty substance to the vinaigrette and just taste good. So, I have scoured the web and found the following recipe that looks extraordinarily promising. Im going to make this this weekend. Slice the tomatoes in half then place them on the baking sheet; put the two cloves of garlic (leave the skins on) in the center of the tomatoes. Place into the oven and roast for 10 minutes. Remove from the oven and let cool. Once cooled, remove the skin from the garlic cloves and place into a bowl along with the roasted tomatoes. Add the olive oil, canola oil, balsamic vinegar, rice vinegar, sugar, fresh basil, and sea salt and freshly cracked pepper, to taste. Mix using a emulsion blender until smooth and creamy. Taste and re season if needed. Set aside and let the flavors mingle for at least 30 minutes before using. I love my boys, but they need culture. We live in the great Pacific Northwest and that means we have access to a wide variety of food genres. In an effort to expose their mac-n-cheese loving pallets beyond the typical ‘kid friendly fare’, my husband and I decided to hit up a Chinese buffet. It was an unmitigated disaster, even if the kids did complement me. We walked around the trays and found items of interest, but it was mostly ‘yucky’ until we reached the table with the cheese pizza and french fries. Maybe this stuff is out there because the owner anticipates children like mine, who have a difficulty getting that first ‘just TRY it’ bite down. But, that is about all they wanted to eat. Honestly though, I couldn’t really blame them. The food at this particular establishment was pretty horrible. I could barely eat anything. Perhaps if I want to win them over to yummy Asian food, I need to find a place that actually serves YUMMY Asian food. It was a new place, and it bombed. So, they ate pizza and I tried to find anything that was worth eating that wasn’t fried. I went home and ate a piece of peanut butter toast. But as we left, Archie said to me “Mommy, your rice is better.” What a sweetie! (I am training him well for his future spouse!) So, here is my very white-girl version of fried rice. To all my Asian friends, I apologize for probably making this horribly, but my kids eat it. I like it because it contains some sort of vegetable and is a quick one-pot meal to use up random leftovers. In fact, click on the picture below to a recipe I found here on WordPress that contains many other ingredients like shrimp. Be creative, throw in what you think will taste good and have fun! Heat large dutch oven on the stove over med-high heat. Whisk eggs and pepper in bowl, set aside. When pan is hot, use the Olive Oil to hard scramble the eggs, set aside. Put chopped protein in the pot and brown off any excess fat (In case you are using ham or other slightly fatty meat). Bring pan to heat again and add the sesame oil with the meat and crumble the rice on top of the meat. Toss to coat the rice in the Sesame Oil. Let sit, while the bottom of the rice browns and toasts. Toss the rice 3 times and keep browning between tosses. Add Scallions, Peas or Broccoli, stir to incorporate. Add Soy Sauce to taste. Lots More Chicken – What Do I Do? Yesterday I sat in my car waiting in line at a local pick up spot to claim my case of Zaycon Chicken. A car full of fussy, fighting, whiny kids, for chicken. Was it worth it? Yes. The chicken is delicious, thick and tasty. Tho next time, I might leave the kids at daycare and pick them up AFTER Ive got my chicken. But this leaves me with a problem. Not the kids, the chicken. What do I make with it? I have a website full of yummy chicken recipes, but what do YOU want to see up here? Any favorites you might be looking for a spin on? Its getting closer to sunny around here in the Pacific Northwest, perhaps some barbecue? What’s on your plate? What is your favorite chicken dish. Share here and we can all delight! Here’s a repeat: works with Easter Ham too! With leftover ham from the holiday dinner, I was at a loss what to do. So, I went to my local WinCo (LOVE that place) to the bulk foods section and bought some navy beans. As a disclaimer, I don’t like Navy beans, or really any type of bean/lentil or pea. Its a weird holdover from childhood. Of course, I didn’t really plan ahead. So I pulled out my trusty Test Kitchen cookbook and wondered (hoped) there was a solution, and there was. I brought the beans to a boil, then capped it with a lid and took it off the heat. 1 hour later, the beans were ready to go. Then, I started throwing things in a pot, and it actually turned out pretty well. The kids and I both ate it without any complaints. Heat the stock pot and add the 3 cups of cubed ham. Cook the ham down to get a good rendering a fat. Add the onion and celery. Sweat the onion and celery till onion is clear. Add the liquid (chicken, beef and water) and the ham bone. Add seasonings (salt, rosemary, basil) and bring to boil. Let simmer gently for 1 hour. Enjoy! Even though I don’t typically like beans, peas or lentils (see disclaimer above) I really liked this soup and can’t wait to make it again.